What is one of the mistakes people make with their daily menus, which might lead to obesity afterward? Well, there are many things. Let’s start with eating schedule. 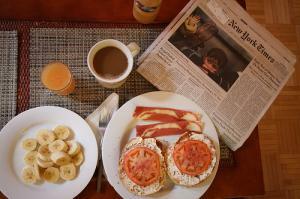 What is the average time of the day when people eat their breakfast? Well – lunch time! This is no joke, people simply skip the breakfast for numerous reasons, which is not good. Since most of people have a steady 8-hour job, this means that they have to get up every morning, take a shower, eat, and then go. This simply takes too much time, especially if a person needs to get up early and travel a lot. This does not make people happy about spending time for preparing a good and nutritive breakfast. But that is essential thing to do, especially for those who want to maintain weight or for those who are trying to lose some weight. So, how to lose weight by eating breakfast and drinking milk, for example? Many experts will say that breakfast should be the strongest meal in a day. This means that it should have the highest number of calories. This is allowed because the entire day is in front of a person, and even if that person has a desk job, a lot of calories will be used. As for the type of breakfast, sometimes some cereals and milk are all that is needed. If there is more time, some stronger meal can be prepared. For example, freshly squeezed orange juice, a bit of low fat bacon with an egg or two, perhaps some low fat cheese and healthy bread and a good and tasty meal is done. Of course, the amounts of mentioned food have to be proper, no exaggeration is allowed, because it will not create the wanted results. Unfortunately, most people simply run out from the house trying not to be late. This means that in most cases, coffee is the only breakfast and this is a problem because the lunch will usually be enormous since a person will simply be starving until the lunch time. If there is no time for preparing breakfast, something else has to be done. For example, orange does not have to be squeezed, just take it to the work, and eat it there. It will take a minute or two, but it is a much better thing than starting the morning with only coffee in the stomach. And if orange could be switched with grapefruit, that would be even better. Reasons why you need to breakfast! Can you have the stomach virus with no vomit or diarrhea? Help me choose healthy please!